Editor's Note: Here at OWC, we are committed to putting our boots on the ground, supporting local, hands-on stewardship initiatives, and celebrating the great watershed work that is happening in our communities. On June 2, Outreach Assistants Dylan and Dorothy headed to the Crowsnest Pass to assist the Quad Squad with a project for Ed Gregor Stewardship Day. Here you can read some of their reflections. 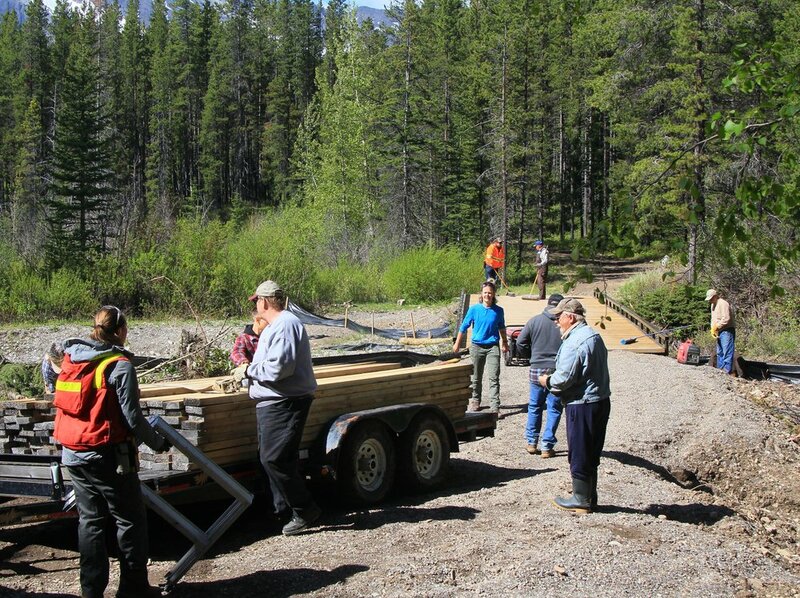 This year on Ed Gregor Memorial Stewardship Day, we went out to Allison Creek to redeck a bridge with the Crowsnest Pass Quad Squad. 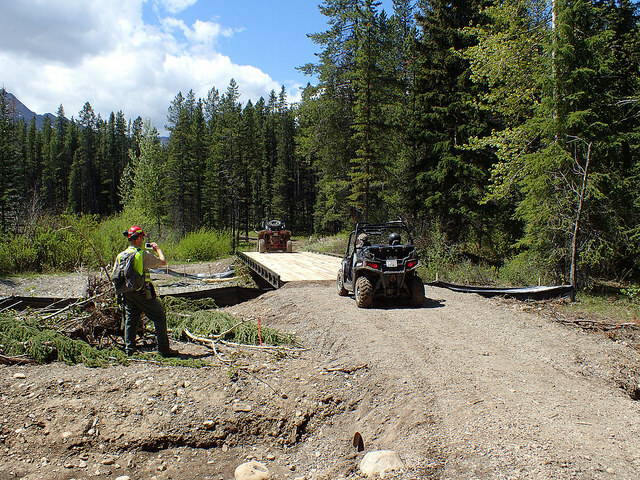 The bridge in question was being re-decked so it would be more robust for snowmobile use - and thereby help keep vehicles out of our headwaters year-round. It’s no wonder we chose this project, as Allison Creek is critical aquatic habitat for both of our threatened trout species, westslope cutthroat trout and bull trout. These species are highly susceptible to increased sediment levels in the creeks where they live and spawn (read some of the effects of sedimentation on trout redds here). Genetically pure westslope cutthroat populations have been reduced to 5% of their original range, while bull trout are only found in 66% of their original range province-wide. Excess sediment also impacts water quality for all of the communities downstream, including Lethbridge. It can clog waterways, decrease the recreational appeal of water, and increase water treatment costs for residents. Throughout the headwaters there is a need for bridges on designated trails as part of a strategy to keep wheels, hooves, and boots from stirring up and washing down extra sediment in our streams and rivers. "By working together towards the goal of clean and sustainable water, we have a stronger and more positive impact than any single group could achieve on its own." Shortly after completing our work, we had the good fortune of seeing our efforts put to use when two side-by-sides drove up. Before crossing Allison Creek on the newly-decked bridge, the riders stopped for a visit. In that moment, we were all (recreationists, government, and not-for-profit staff) united by our appreciation and mutual respect for Alberta’s beautiful backcountry. By working together towards the goal of clean and sustainable water, we have a stronger and more positive impact than any single group could achieve on its own. Redecking this bridge over Allison Creek to support snowmobile use will help keep vehicles out of our headwaters year-round. The Ed Gregor Memorial Stewardship Day is going into its 25th year next year and, to our knowledge, is the longest running stewardship day of its kind in Canada. This event was named after the late Ed Gregor who worked with the Land & Forest Division of Alberta Environment and Parks. Every year that this event has been running, volunteers have made positive contributions to the local environment. Projects have included garbage cleanups, trail maintenance, bridge work, education stations, and many other activities. The collective efforts of the volunteers, clubs, and organizations involved have totalled more than 1.5 million volunteer hours to date. If this sounds like your kind of gig, you can always Volunteer, Donate, and/or Make a Change. Check out other great summer events happening in our watershed! Dutch Creek to help protect our headwaters!